Slots enthusiasts of all levels of experience will recognize the big “five” symbols of the slots genre – the fruits like cherries, plums, and oranges, the bell symbol and the crown. These symbols illustrate the theme of the “Royal Five” slots game by PlayTech, where traditional five reels, five paylines slots fun is available. The easy to see and use features along with the bold and colorful graphics give players a very satisfying experience from the start of play. Uncomplicated images make winning combinations easy to read and the old-fashioned graphic design of the game screen and background make this an enjoyable and relaxing game to play. The coin values of one cent to five dollars, and a maximum coin wager of twenty coins makes the two thousand coin jackpot a flexible venture. Conservative gamers can keep their bids low and still take home a tidy sum, while bolder or more experienced slots players can present higher wagers to take home tremendous winnings. Many slots enthusiasts really enjoy the opportunity to use an autoplay mode during their game time. This dramatically increases the rate or speed of the game by eliminating the need to continually hit the “spin” button. Instead the feature handles the trigger for the player over and over. If a gamer decides to enter back into controlled and active play the feature is quickly and easily disabled, and if they wish to just increase their standing bid they can do so and reactivate the autoplay mode. 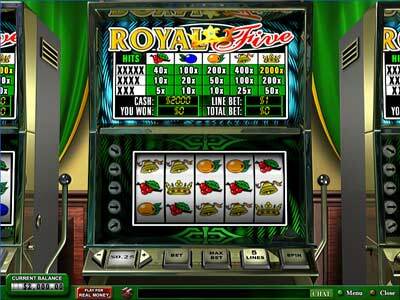 The paylines on the “Royal Five” slots game are the standard design for five reels and five paylines – three horizontal and two diagonal methods of creating or capturing winning combinations. The two diagonal lines are actually in a “V” configuration, with the starting points at the upper and lower corners of the left side of the reels, from where the lines head to up or down to the center reel and continue back towards the upper or lower corners of the right side of the reels. While this may sound confusing, one quick look at this winning configuration will instantly show a gamer how many opportunities are added for winning combinations by theses extra paylines. The “Royal Five” slots game gives some nice rewards, and with the flexibility of the amount wagered it presents the opportunity for huge winnings. The royal gold crown symbol creates the jackpot situation, when five are revealed along any payline the player is given a hefty two thousand coin payout in the amount they have wagered. Four of these crowns on a payline present the player with two hundred coins and three bring in a nice fifty coin payout. The golden bell “rings” in some big winnings as well, with a full reveal delivering four hundred coins, four bells on the payline bring one hundred coins to the player, and three revealed along any payline give twenty five coins to the winning spinner. The orange gives up two hundred coins on a full reveal, while four symbols bring in fifty new coins in the amount wagered, and three orange symbols deliver ten coins to the spinner. The plum gives one hundred coins on the full, five symbol reveal, twenty coins for an appearance of four on the payline and ten coins for three reveals. Finally the classic cherries symbol brings a nice satisfying forty coins on a full reveal, ten coins for four symbols on a payline and five coins for an appearance of three symbols.